No matter how often you visit a destination or your favorite vacation spot, it seems there is always something new and exciting to see or experience. This is was happened the other day in São Paulo, Brazil. Even though I have been to São Paulo and Brazil at least 100 times in the last 20 years, a friend at breakfast had asked if I wanted to do his walking tour of São Paulo. I was about ready to back out and spend the day doing computer work. 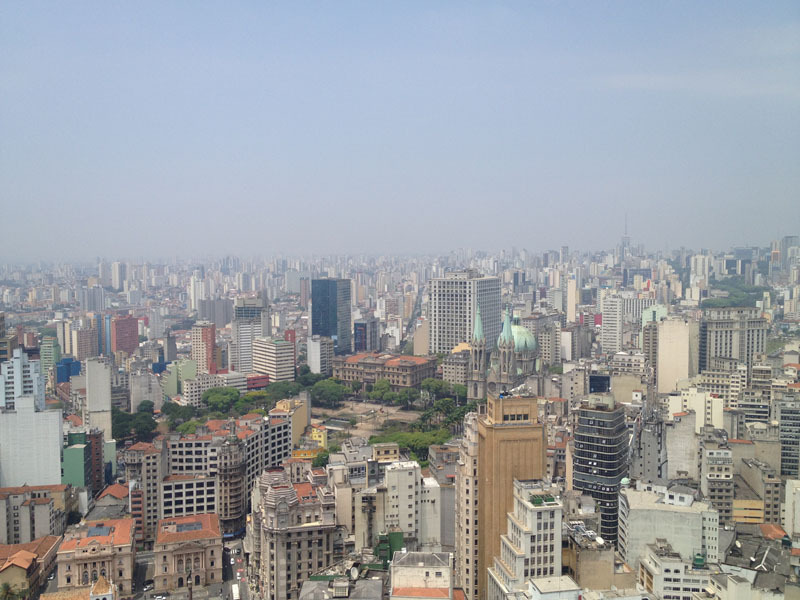 What peaked my interest was the mention of going to the top of one of São Paulo's highest buildings and viewing the city from the observation deck. I had never done that, or for that matter never knew you could. 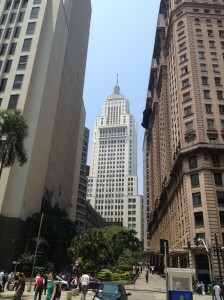 The Observatory was located at the top of the Altino Arantes building also known as the Banespa Building. Not realizing this attraction was available and having passed by this building so many times at the corner of João Bricola and Antonio Prado streets right in the heart of the old financial district of São Paulo, it was time to see. Taking the subway down to the Sé Station located at the Cathedral de Sé, it was a short 5 minute walk to the Altino Arantes building. Standing at 529 feet (161,22 meters) 34 floors, Altino Arantes building is one of the tallest buildings in São Paulo and Latin America. Visiting Altino Arantes is free to the public. The only requirement was showing your driver's license or passport so security could make a photo copy as well as take your picture. Only 5 people are allowed at a time at the top of the observatory with a viewing time limited to 5 minutes . Two elevator rides , one to the 26th floor with 10 people then the second elevator to the 32 floor with a capacity of 5 people. From the 32 to 34th floor was done by climbing 5 flights of stairs. Arriving at the top we were greeted to a spectacular view of São Paulo, even though there was a bit of haze in the air and unable to see the surrounding mountains you were still given a sense on how big São Paulo really is. Average time for visiting the observatory atop the Altino Arantes building is 35 minutes with 5 minutes at the top. This day it took us about 1 hour but well worth the wait for the view of the city. Oh no! did I jinks myself on writing my last blog post “My Endless Summer“? That’s what I was thinking as we flew in this Saturday morning into Sao Paulo Brazil. Leaving last night for the 10 hour all night flight from New York JFK International Airport I knew the weather was calling for rain and cold weather in Sao Paulo, upper 50′s, hey that is cold for Brazil. Well as we started the approach into Sao Paulo Guarulhos International Airport the airport weather was calling for overcast skies, as we turned on final approach we realized the weather report was a little behind for we were getting light to heavy rain. Breaking out of the clouds just a couple hundred feet above our missed approach altitude of 2644 ft (200 ft above the ground) we could see that it was going to be a very wet day in Sao Paulo. The ride into the city was not improving weather wise, the rain was still coming down and it was cold. Should not have written that last article on my string of sunny days . Oh well. Ok this will be a sleep day and an indoor day. Checked into the hotel, agreed to meet my first officer at 2 in the afternoon after a couple hours of sleep and we would see what the day has to offer. Threw back the curtains at 1:30 to find a cloudless day, the Gods had ended the rain, they had given a nice washing down of Sao Paulo and and now the sun was out in full force, and the temperature was now in the mid 60′s. It was going to be a great day in Sao Paulo, let the endless summer continue. Met up with the copilot and decided to head down Paulisto Ave to the electronic flea markets, you know the place to get DVD’S and software for cheap, we were just looking:). Later I met up with some friends from the Miami flight and decided since it was Saturday, that we would head over to Vila Madalena, one of Sao Paulos western suburbs. Arriving in Vila Madalena since I had been there many of times and this was the first time for 2 of the guys, I showed them the winding street that is covered with about 50 wall murals or as they call it in Sao Paulo graffiti. 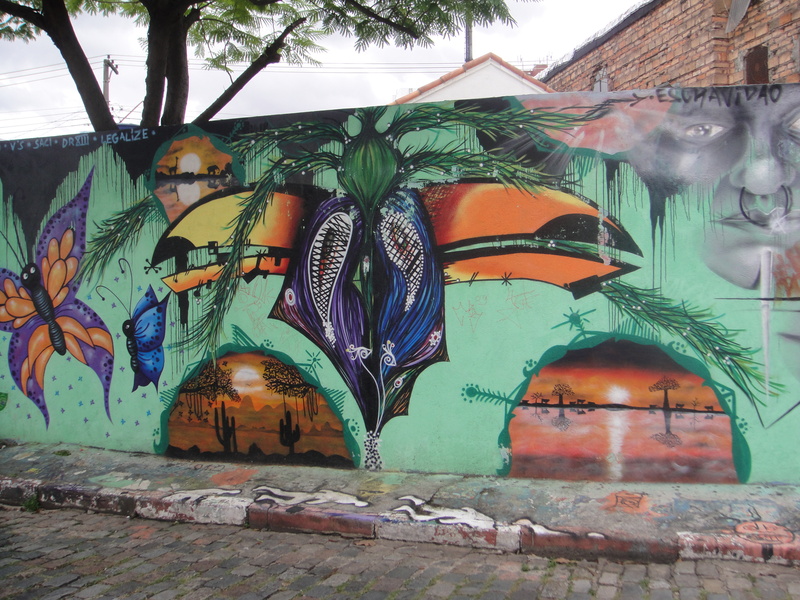 For those that are new to Vila Madalena, this is a great neighborhood for travelers who arrive in Brazil and immediately ask the question, “What is the nightlife and entertainment like in Sao Paulo?” The region thrives off of dance clubs, restaurants, culture, and art. It is one of the most popular areas for young adults in Brazil and offers one of the most exciting cultures that visitors can imagine. Leaving the walls behind we headed down Rua Aspicuelta, the heart of the night life in Vila Madalena. Saturday night and the area was alive with music an people, the sidewalk cafes were full of people enjoying the cool night.A quick stop for refreshments in Salve Jorge and admiring of the antiquated photos and nick knacks. After wards we were able to get a table for the 6 of us at Boteco Sao Bento, what a great place to spend Saturday night, great music, great Brazilian steaks and of course great conversation with friends. As we headed out of Vila Madalena we passed through the intersection of Rua Wizard and Rua Harmonia, another popular street of restaurants and bars in Vila Madalena. The area also was busy with the restaurants and outdoor cafes full, will have to wait for next time since had a early get go on Sunday for out trip to Rio de Janeiro for the day. So with my initial worries of jinking myself with my last post, the weather cooperated, and we had another day in Sao Paulo that I think I could add to my endless summer streak. But then again it is not always the weather that makes traveling enjoyable, most the time I think it is sharing the moment with friends in a far off local. Looking for more information on Vila Madalena? 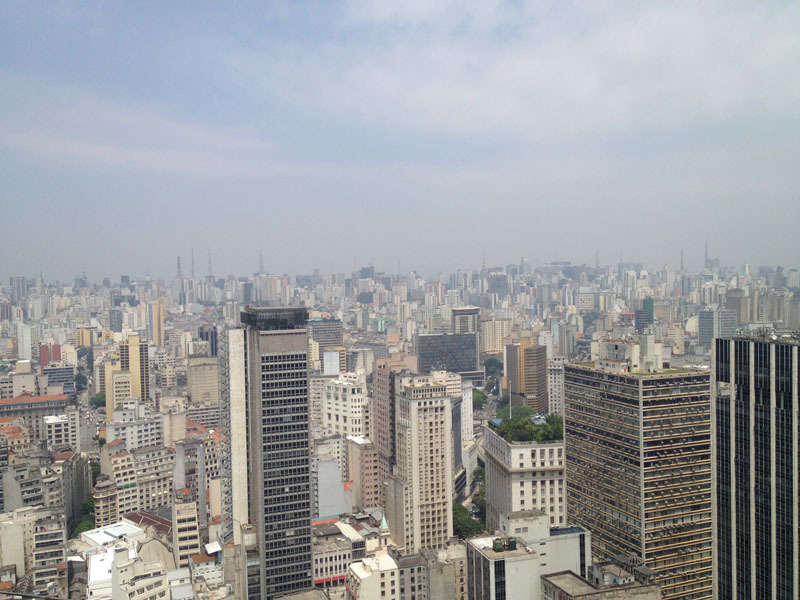 thinking about traveling to Sao Paulo or Brazil? then come join us at Beachcomber Pete Travel Adventure Guides.